When you’re the world’s top tennis player, it sure helps your marketability when you are also a gorgeous physical specimen. 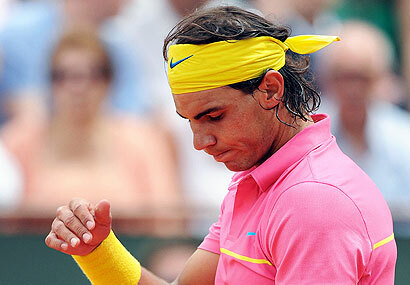 Rafael Nadal is the sport’s marquee name and face and the men’s magazines have taken notice! Rafa turns 23 on Wednesday and will celebrate it in Paris where he is competing for a fifth consecutive French Open title. I hope he has a happy birthday but I’m really hoping Roger Federer will spoil the party next Sunday where the two are likely to face-off in the final for the fourth straight year. Federer has never beat Nadal in Paris but this could be his year. UPDATE: The unthinkable has happened: Rafael Nadal lost in Paris for the first time in his brilliant career there. His streak of four straight titles and 31 consecutive matches came to an end against Sweden’s Robin Soderling 6-4, 6-7, 6-4, 7-6. It really is one of the greatest upsets in the tournament’s history. I. Am. In. Shock. The loss gives a major boost to the chances of Roger Federer, the second-ranked player who has won every one of the sport’s big titles except for Paris. And there’s been one reason for that: Nadal. Federer lost to Nadal in the semifinals in 2005 then in the final in 2006, 2007, 2008. He next plays Germany’s Tommy Haas on Monday and unless he has a broken leg, I’d bet my laptop on Federer.